Liz's Paper Loft: MCT 55th Edition Sneak Peek #1 ~ happy father's day! 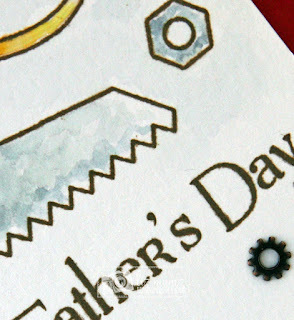 MCT 55th Edition Sneak Peek #1 ~ happy father's day! Wow, I can't believe it's already May and time for another release from My Creative Time! Today I get to share the new stamp and die set, GREATEST HANDYMAN. This set is a must have to create the "manly" cards we all struggle with, though not only for cards. I'm in the middle of a kitchen makeover and these fun tools will be great for a scrapbook page! First I stamp all the images on the watercolor paper. Next I scribbled SU markers on a pallet. With a brush and water I used the "scribbles" to water color the images. After all were dry I added glossy accents and few little metal gears. Makes a cute man card. Would even be cute in pink for a girl. OMG Miss Liz Your card is so awesome....great creative job on the tools your coloring is fab and your total look is amazing. Definitely a super outstanding creative job!! Oh they will be awesome for scrapbooking...can't wait to see your pages of your remodel. Love the layout of all the tools. Awesome job with the design of this card! I like how you laid everything out and added the the little accent pieces! Perfect man's card! 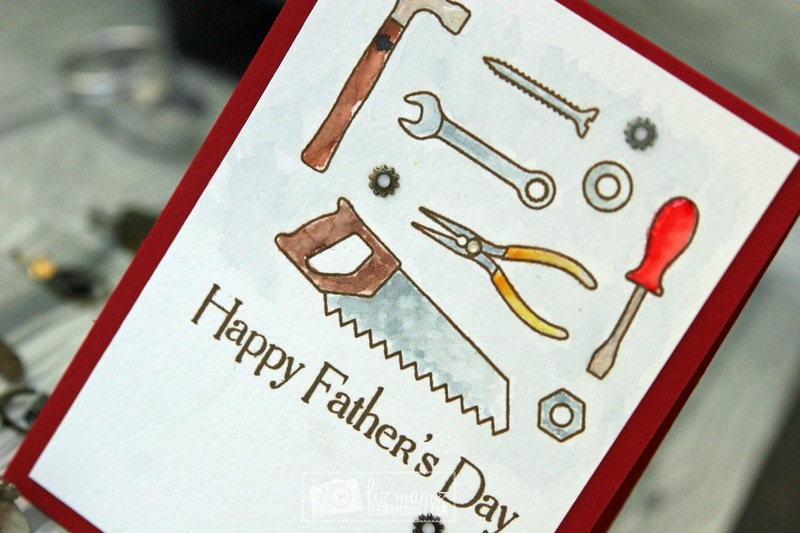 Cute card and perfect for Father's day, tfs!! Such a fun card, Liz! Love the watercoloring! This set will definitely be great for your remodel scrapping! Great card to show off many of the stamps in this new set! Thanks for sharing your fantastic Father's Day card. LoVe how you used your water colors. What a great Father's Day card! This tool set is so awesome. Love your card, very excited about this new set for manly cards woohoo! Fun card! Loving this new tool set stamp! So fun! I can't wait for the new release! Such a fun card! This is such a great start to the new release! I can't wait to have this new stamp set and to see what else is coming this week! I love this set. Very cute card. Great card, nice coloring. Perfect card. awesome collection of bolts and tools!!!! wonderful for guys of all ages especially my little grandson!!! I like how you stamped and watercolored all these images. The tools look great I love the glossy accents on the nuts and bolts. These tools would look great on a scrapbook page. How exciting to do a kitchen remodel. Cute card! I love how you added the little gears! Great job on your card! I love the tiny gears you added. This set is adorable and is a must have for manly cards. Good idea for scrapping construction pictures. Mens cards are always a struggle for me, this set will help me with those cards. Awesome card! Nice and simplistic too which is even better for a masculine card because most guys don't like all the frilly stuff, lol! Fantastic job! Such a cute card! Love the water coloring of the tools!! 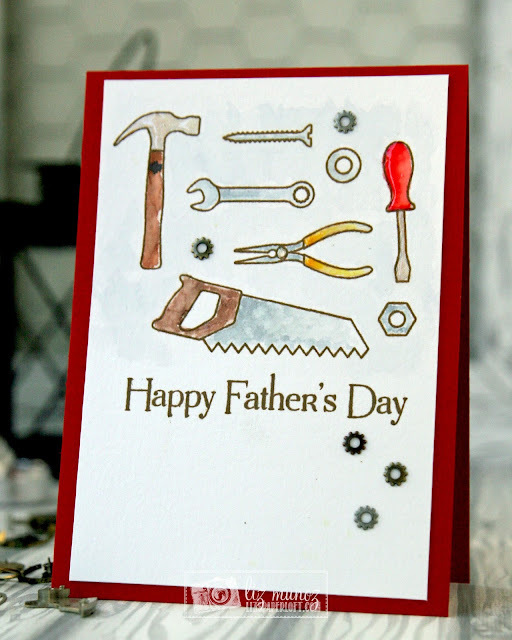 Your guy is going to love this well organized tool card! Awesome card! Love the gears!